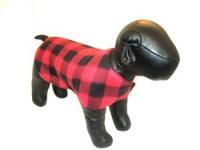 Red and Black Checked Fleece Sweater Red and Black Checked Fleece Sweater  - $7.00 : Your Pet Store, Made in the USA! This is a warm, but light-weight fleece sweater that is very easy to put on your dog. Fleece fabric helps your dog retain it's body heat and repels light snow. There is a vecro closure across the dog's chest and a velcro strap around the body to ensure a snug fit. This sweater is comfortable enough and fits securely enough for your dog to wear it all day! This is another product proudly made by us in the USA!! Measure your dog from the base of the neck (where the collar fits) to the base of the tail (where the tail starts). Round the measurement up to the next even length in inches. Select that size from the Dropdown menu below. If you don't see the size you need for your dog, or have a dog with an uncommon body shape, please feel free to email or call us--we can custom make any size!